"SolidWorks Simulation Standard" vs "SolidWorks Premium"? There is a new promotion package (1) being offered including "SolidWorks Standard" + "SolidWorks Simulation Standard" (apparently a relatively new addition to the lineup) + 1 year subscription. The price is essentially the same as another promotion package (2) for "SolidWorks Premium" (actually "SolidWorks Professional" with an immediate upgrade to "SolidWorks Premium") + 1 year subscription. I'm interested almost exclusively in modeling relatively simple 3-D assemblies comprising several solid parts made of different materials and, especially, in performing linear static FEM analyses on these assemblies subject to external constraints (fixtures) and gravity. I don't anticipate any need for non-linear-, dynamic-, or thermal-analysis, drop tests, etc. The linear static FEM in "SolidWorks Simulation Standard" **appears** to offer more control than the similar capability of "SolidWorks Premium," but it's rather difficult to tell because the comparison matrix for the latter does not get very specific in terms of "FEM" controls, "Contacts and Connectors," or "Linear Static Simulation for Assembly." Is there really any difference? If so, this would suggest that new combo (1) is the way for me to go. On the other hand quite a bit is cut out of the 3-D CAD capabilities of "SolidWorks Premium" when 'downgrading' to "SolidWorks Standard," suggesting that (2) might be the better choice, although it's not clear that I would miss any of the fancy stuff. Re: "SolidWorks Simulation Standard" vs "SolidWorks Premium"? SolidWorks Premium will give you linear static analysis and motion. It will add also more CAD add-ins lke SolidWorks routing, scan to 3d, Toolbox, rendering (see the product Matrix for more details :3D CAD Matrix | SOLIDWORKS ). SOLIDWORKS Simulation standard will give you linear static, motion, trend tracker, and fatigue. Another difference: SolidWorks Premium is a license where CAD and analysis go together, you can't therefore transfer only the simulation functionality to another solidworks license (supposing you have two or three solidworks Cad licenses). SolidWorks Simulation standard is a standalone analysis license with its own serial which you can float or transfer between your solidworks licenses. 1) Most importantly, are the linear static analysis capabilities actually identical between the two packages? a) I see a lot more details in the matrix for SolidWorks Simulation Standard (some of which, like "Mesh control capabilities" and "h and p adaptive element type," sound important) than for "SolidWorks Premium" (apparently all under "Structural Part and Assembly Analysis" in that case). c) I've heard that there's a "Large Displacement Mode" that provides an automated sequence of solutions to approximate non-linear problems within linear analysis, but I don't see anything about that anywhere. d) Finally, I will need to export selected numerical results in the form of arrays of nodes, displacements, etc., for external computations (see thread at "forum.solidworks.com/thread/63028" for more details.). Can I expect to do that as easily with either package, or might that feature work better in "SolidWorks Simulation Standard?" 2) I should clarify that I'm an individual retired scientist who will be working primarily on my own in a "hobbyist" mode. I'm new to both CAD and FEA, having only worked on one analysis project remotely with a friend who has a SolidWorks Premium license. The most collaboration I'm likely to do is to exchange models with my friend. Obviously I'm not in an industrial environment, so at most I would send drawings out to a machine shop for single-unit fabrication. I don't really understand what "SolidWorks routing, scan to 3d, Toolbox, rendering" or "trend tracker" are, nor how I might use them. (I guess I have more homework to do...) Are there any enhancements from "SolidWorks Standard" to "SolidWorks Premium" that I would be likely to need? 3) Thanks for the tip about the separate licenses. I guess that means with the dual package (1) I could potentially continue my subscription for and/or upgrade one piece but not the other. Right? Featureworks: when you import a part from another system or neutral file format (e.g. step or iges) you get no feature history, and therefore you cannot edit a part by changes its features, but you need to use direct editing. Many times it's easier to have SolidWorks recognize features and build all the features of that imported parts (e.g. extrusions, fillets). This way you can easily edit the part by editing recognized features. yes, but remember simulation needs a solidworks license in order to work, therefore you can't quit solidworks subscription, you can only make the other way around. Alessandro -- Let me make sure I understand you. If I purchase both SolidWorks Standard and SolidWorks Simulation Standard (say, in the current promotion that includes a 1-year subscription to each) but I do not extend the subscription to either, will SolidWorks Simulation Standard stop working after the first year? SOLIDWORKS licenses are perpetual. License will continue working after maintenance has expired. 1) You quit Simulation Standard service subs next year but you renew solidworks maintenance. You will be able to upgrade solidworks to the next release but not simulation. This means that in order to have simulation working you will need to have two different solidworks releases on your machine (2015 and 2016). 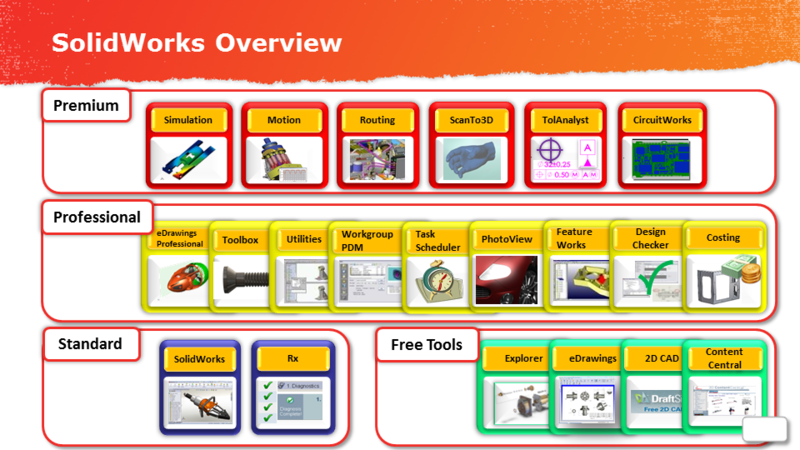 You will be using simulation 2015 with solidworks 2015. You simply cannot. Simulation works perfectly integrated in the SOLIDWORKS interface, therefore how would you use a simulation 2016 if you don't have SOLIDWORKS 2016 ? 1) We're currently in Sp0. I would never keep a sp0 as a perpetual version to use. I would rather purchase 1 year maintenance in order to receive all service pack (SolidWorks 2015 will end its developement cycle at SP5, which is usually released late november). 2) Tech support is very useful, especially the first year you're using the software. I see many of our customers improve their simulation skills when I give them support pn their real world analysis cases. Dassault Systèmes asks application engineers to get certified every year. I can assure Simulation Certification is tough because it doesn't measure whether you know where's the button to push, but it measures whether you can solve a real analysis problem with the software, plus it measures how often you use the software, because you really have to be quick (there are many analysis problems to solve and a very limited amount of time). Your VAR will have a certified simulation application engineer, and that will be your man. from a simulation standpoint the only difference is that swx prem does not have trend tracker or fatigue or access to materiality. Jared (and all) -- First, thanks for all the clarification. It is now clear that SolidWorks Premium is what I should purchase. i've always said it is amillion dollar idea. maybe time to go on shark tank. if you're doing static, its a tough choice, personal opinion is that swx prem is the better deal if you can find use for a few of the cad tools. fatigue is nice but you need to want to check fatigue and at that point, why not move up to sim pro and check buckling or use optimization and almost everyone can use thermal. trend tracker is nice if you use it!